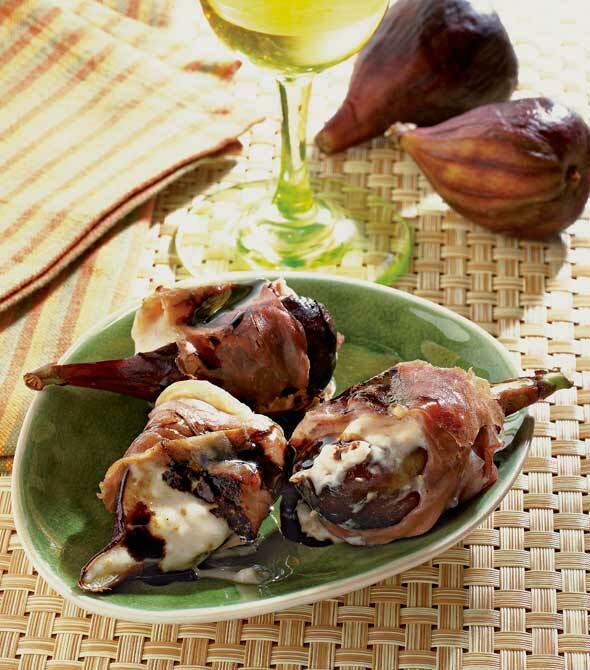 For these grilled fresh figs with country ham, plump figs are slathered with blue cheese and mascarpone cheese, wrapped in country ham and grilled. 1. In a small saucepan over medium heat, cook the vinegar until it is reduced to about 6 tablespoons and syrupy. Let cool and keep at room temperature. 2. Slice each fig in half lengthwise. Using a grapefruit spoon or a regular spoon, remove a bit of the seedy inside part of each fig and place it in a bowl. 3. Add the blue cheese and mascarpone to the bowl with the fig flesh and mix well. Season generously with pepper and stir to combine. 4. Take each fig and gently stuff with about 1 tablespoon cheese mixture. Wrap a piece of ham around the fig and cheese. Place on a baking sheet, cover with plastic wrap, and refrigerate for about 1 hour or up to 4 hours. 5. Oil the grill grate. Light a charcoal fire or preheat your gas grill on high. Let the coals burn down to a medium-hot fire or adjust the gas grill burners to medium-high. 6. Place the figs on the grill cut side up. Cook, turning as needed, until the ham is a bit crisp and the figs are warm, about 5 minutes. Place on a platter and drizzle with the balsamic syrup. Serve immediately. I spotted nice ripe mission figs and had the stilton and chevre on hand, so this recipe gave me pitch-perfect proportions to make this spur of the moment on a Friday night, and a drizzle of already thickened dark, fruity balsamic made it a standout. This recipe scaled down beautifully by 1/3 for use with some white stilton and chevre (which stood in for the mascarpone and also countered any extra sweetness since the white stilton had bits of mango and ginger). I also used prosciutto in place of the ham. Bonus—it can be finished on the stovetop in a cast iron pan if you don’t have a BBQ grill handy! 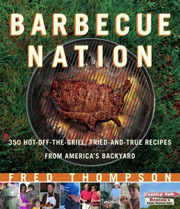 Grilled Fresh Figs with Country Ham Recipe © 2007 Fred Thompson. Photo © 2007 Brian Hagiwara. All rights reserved. All recipes and photos used with permission of the publisher.